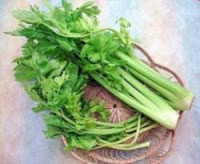 Celery in scientific language called Apium graveolens L is included leafy vegetables and medicinal plants used by for seasoning. Even in some countries, including Japan, China and Korea celery stalk is used as a food ingredient. Celery plants have a distinctive aroma that comes from a number of volatile components of essential oils it contains. The main content of celery is butilftalida and butilidftalida as the main carrier of aroma. There are also a number of flavonoids such as graveobiosid A (1-2%) and B (0.1 to 0.7%), and compound phenol group. The other component is apiin, isokuersitrin, furanokumarin and isoimperatorin. The main fatty acid content dalah petroselin acid (40-60%). The leaves and stalks of celery leaves contain steroids such as stigmasterol and sitosterol. Celery is a versatile plant, mainly as a vegetable and herbal medicines. As vegetables; leaf, petiole, and celery root can be used as a soup mix. Celery leaves are also used as a salad, or diced and sprinkled over soup meatballs, soup, a variety of other soups, or even chicken porridge. Celery is also touted as an anti-hypertensive vegetables. Celery contains Apigenin is said to prevent the narrowing of blood vessels and Phthalides can relax the muscles relax the arteries or blood vessels. Content that is regulating blood flow which allows blood vessels to dilate and reduces blood pressure. Another function of the celery is as a laxative (diuretics), anti-rheumatic and power appetite (karminativa). Tubers possess properties similar to the leaves but also used as afrodisiaka (of passion). Celery is rich in food sources of vitamin A. The darker green the leaves, the higher the amount of vitamin A it. Celery also contains vitamins C, B1, B2, calcium, magnesium, phosphorus, potassium, and coumarins which is believed to prevent cancer. A chemical component in the essential oil derived from the seeds of celery exhibit anti-cancer properties, and many studies have shown positive results that celery role in slowing the progression of pancreatic tumors, breast, and liver. However, celery potentially cause allergies in some people who are sensitive. Therefore, patients with inflammation of the kidneys is not recommended to consume. In addition, Veleslavin (1596) warned me not to eat too much celery because it can reduce milk (WikiPedia).